And so it all falls into place: Mike Rockenfeller will drive the #7 (we assume) Penske Motorsports Spyder at Petit Le Mans, Patrick Long will drive the #31 Petersen / White Lightning Porsche 911 GT3-RSR and Dominik Farnbacher will drive for Alex Job, with Robin Liddell and Marcel Tiemann. Meanwhile, over at Jarama this weekend, Marco Seefried replaces Farnbacher in the Pierre Ehret Porsche. “My actual teammate Dominik Farnbacher has an important appointment this weekend and so it is not possible for him to start,” explains Pierre Ehret. Is that testing, with AJR, or something else? Rockenfeller and Long have been team-mates all this year, in the AJR Rolex Series Crawford Porsche: perhaps the move to LMP2 is indicative of how badly Porsche wants to hang onto the young German? 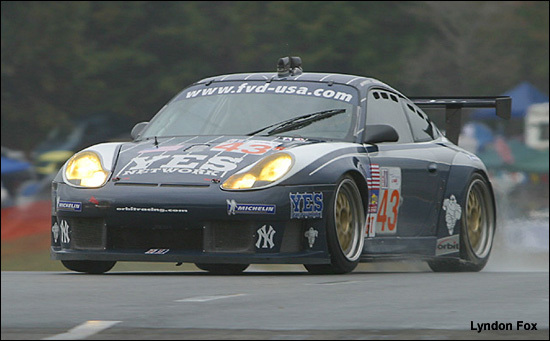 This year’s Petit Le Mans is actually the third anniversary of Rockenfeller’s first drive in the ALMS, in the BAM! (was it Orbit then?) GT2 Porsche.